Brig. Gen. Daniel Ziahnkhan turns 45 on July 12, 2016. Born in 1971, he was only nine when Master Sgt. Samuel Doe’s People’s Redemption Council (PRC) seized power in 1980. But he is definitely old enough to recall. For by the time Doe was assassinated in 1990 by Prince Johnson (now Senator for Nimba County) of the Independent National Patriotic Front of Liberia (INPFL), Ziankhan was already a man of 19. He completed secondary school at the Assemblies of God Mission (AGM) in Monrovia and later obtained a Bachelor’s in Business Administration from the African Methodist Episcopal Zion University (AMEZU). By the time he received his first commission as 2nd Lieutenant at the age of 36, President Ellen Johnson Sirleaf had begun her first term. The young man went on to attend specialized military training courses in Egypt, Sierra Leone and the United States, where he became a qualified paratrooper and earned a Master’s degree in Military Science and Strategy. “A little learning is a dangerous thing. Ziankhan went on to author a book, Impact of Military Coups D’état on West Africa’s Socio-Economic and Political Development (2012). 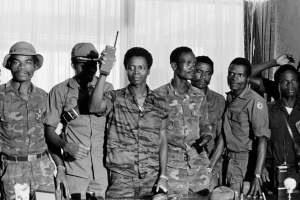 The book alleges that elitist West African administrations, having broken free from colonial rule, went on to abuse their inherent authority over their respective militaries. Said militaries overturned elected governments and seized power in coups d’état and civil wars, the impacts of which have taken the sub-region’s socioeconomic and political institutions decades to recover from. Indeed, by the time Ziankhan took command of the Armed Forces of Liberia on February 11, 2014 at the age of 42 from decorated Nigerian General Suraj Abdurrahman, Ziankhan had borne witness to the worst (in the Samuel Doe and Charles Taylor eras), and had been trained by the best – the US military and his Nigerian predecessor. And thus, two roads diverged in a wood – or had his path already been chosen for him? For the first two years of his command, the young general by and large kept a low profile, staying out of the public eye and giving the AFL a new image as the people’s military. Until, that is, last Friday, June 3, 2016, when he flexed his military muscle at veteran Liberian journalist, Kenneth Y. Best. In its May 30, 2016 edition, this newspaper had published a story entitled “Latecomers,” highlighting the 25- to 40-minute late arrival of Liberian military officials, including Defense Minister Brownie Samukai and General Ziankhan, to an official function held by the United Nations Mission in Liberia (UNMIL). The story was followed by an editorial, in a subsequent edition, on the importance of time. Both story and editorial offended the AFL Chief of Staff, who quickly summoned both the publisher, Kenneth Y. Best, and the reporter who authored the story, Joaquin Sendolo. The publisher immediately sought legal counsel and was advised NOT to honor the summons under ANY circumstances for two main reasons: (a) the summons was in complete violation of the Liberian Constitution and the Uniformed Code of Military Justice (UCMJ), which states that under no circumstances are civilians subject to military investigation or law; (b) the lawyer, Cllr. Tiawon Gongloe, had himself witnessed the rule of martial law under the Doe and Taylor regimes and advised the publisher that “anything could happen” to him should he appear before the Army Chief of Staff. Mr. Best, who himself had suffered the brutalities of the Doe and Jammeh regimes in Liberia and The Gambia, respectively, needed no convincing, and heeded Cllr. Gongloe’s advice. Instead, the paper announced the summons in a story in its Monday, June 6, 2016 edition. On that day, Best received a call from the office of the Chief of Staff requesting that he appear at 2 p.m. When the publisher asked the caller whether the Chief of Staff had read Monday’s story on the summons, the caller answered in the affirmative, but still insisted the publisher appear at 2 p.m. Mr. Best even received a call from Defense Minister Brownie Samukai’s Deputy, requesting that he appear at 2 p.m. When he insisted that Defense officials read Monday’s account of the summons containing the lawyer’s advice, the phone calls ceased. (d) What does this say about President Ellen Johnson Sirleaf and her ability to lead, if her lieutenants can pull these stunts on her watch? This begs the troubling question as to whether she has lost control, or worse, whether they are acting on her behalf! Is she throwing the rocks and hiding her hand? Why are these human rights violations going unpunished? (e) Finally, with what temerity does the Army Chief of Staff summon a publisher? What will he do the next time he is “offended”? If he is acting on his own military authority, then that is major cause for concern. Do we have a runaway military on our hands? Are we seeing the signs of things to come? Is that why Brigadier General Daniel Ziankhan studied Military Science and Strategy? What strategy is this? What would be the Impact of Military Coups D’état on Liberia’s Socio-Economic and Political Development? Is this what he learned at Fort Leavenworth, Kansas? Two roads diverged in a wood. It seems Daniel Ziankhan is taking the beaten path – the one most traveled by Africa’s military men.